One of the biggest events will be at Dewsbury Road Community Hub on Saturday 23 June 1-4pm. The family friendly outdoor event will feature performances from Polska Szkola Bradford, Fabienne, Hombre, The Sole Majors and Jungle Warriors Sound System. The Playbox toy container will be there with giant outdoor games, media make up, photobooth, games jab, mini Police and plant a pot. There will also be a craft market featuring local makers. There are two Great Get Together events taking place in Middleton on Friday 22 June. 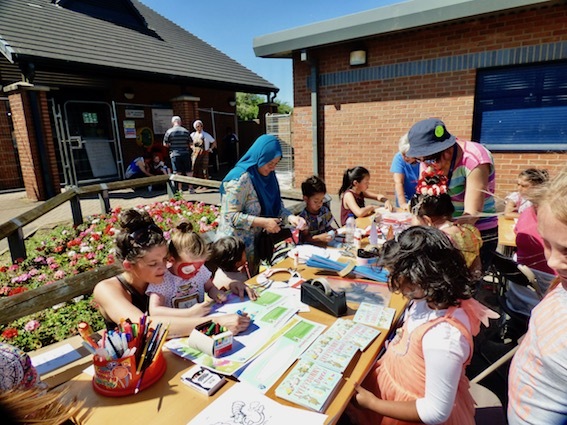 St George’s Centre will have outdoor games, sports and refreshments, whilst the Council’s Adults and Health service are inviting everyone to join them in Middleton Park for a picnic from 11am-3pm. Some of the local resources and fun activities that will be taking place during the event include: taster of groups across all our service such as, such as fishing for wellbeing, art, salsa, chair based dancing, football and much more. There will be face painting and bouncy castles for all ages; live music and entertainment throughout the event, which will range from Steel drum band, D.J live Drama production from the Physical Impairment Service to a performance from the service’s choir. There will also be refreshments and fast food stalls at the event to suit all. Then on Monday 25 June what promises to be the greatest international food fuddle takes place as Holbeck Gets Together at St Matthew’s Community Centre, 1-2:30pm. This event has been organised by Touchstone’s MAP+ (Migrant Access Project Plus) and Holbeck Elderly Aid in partnership. Come and meet your neighbours and bring a plate of something to share. NEXT POST Next post: Hunslet RLFC players during World War 1 – can you help?